Check Point NGX VPN-1/Firewall-1 is the next major release of Check Point's flagship firewall software product, which has over 750,000 registered users. The most significant changes to this release are in the areas of Route Based VPN, Directional VPN, Link Selection & Tunnel Management, Multiple Entry Points, Route Injection Mechanism, Wire Mode, and SecurePlatform Pro. Many of the new features focus on how to configure and manage Dynamic Routing rules, which are essential to keeping an enterprise network both available and secure. Demand for this book will be strong because Check Point is requiring all of its 3rd party developers to certify their products for this release. Check Point is the undisputed market leader for software based firewall products that protect servers. 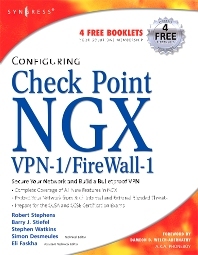 This book provides comprehensive coverage of their next full product upgrade: Check Point NGX. It will be required reading for their user base of over 750,000.